FUE Hair Transplantation is a surgical treatment that is used as a solution to hair loss. The treatment involves transplanting individual hair follicles from a part of the body known as the ‘donor site’ into the bald part of the head called the ‘recipient site’. 1. What is FUE Hair Transplantation? FUE Hair Transplantation is a surgical treatment that is used as a solution to hair loss. The treatment involves transplanting individual hair follicles from a part of the body known as the ‘donor site’ into bald part of the head called the ‘recipient site’. In an FUE Hair Transplantation, each hair follicle is individually taken directly from the donor site with no strip of tissue being removed. Find best results with Hair Transplant in Mumbai at Sakhiya Clinic. Hair transplant is carried out under local anesthesia. After the hair treatment, the patient is given instructions about post-operation. Thanks to its experienced hair transplant surgeons and cutting-edge technology, we offers patients pain-free and scar-free hair transplant at a very relaxing setting. 3. How long does FUE Hair Transplantation take? 4. Is FUE Hair Transplantation painful? 5. Do any scars remain after FUE Hair Transplantation? Thanks to advanced technology used for hair transplant, no permanent scar remains after hair transplant. 6. Does my hair look natural after FUE Hair Transplantation? Yes, with FUE technique, hair looks natural after hair transplant. 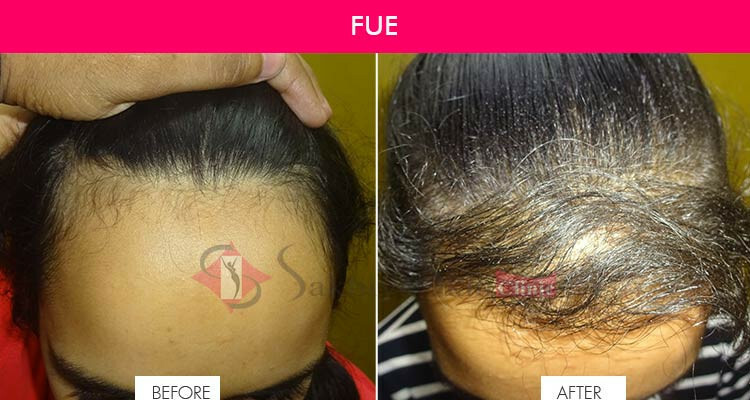 Sakhiya Clinic, the best Hair Transplant Clinic in Mumbai offers an apt solution to get away with baldness. 7. Which part of the body do you use as a “donor-site”? 8. How long does it take for my new hair to grow? It varies from one patient to another. It may take from 2 months to 6 months. First new hair will grow then it will fall out. Then you will see the transplanted hair is growing stronger and thicker. For affordable Hair Transplant Cost in Mumbai, pay a visit to Sakhiya Clinic.